It's fiddlehead season! I think they taste like asparagus, with such a whimsical look it makes them even more interesting with their short growing season! Available May, June, July here in North America. Visit Go New England for plenty more recipes! A quick meal with lots of crunchy, colourful vegetables! Wash and prepare the fiddleheads by removing the fuzzy fronds and cutting off any dry ends. Boil in lightly salted water for 10 minutes, then drain and rinse well. Meanwhile, wash and chop other vegetables, ginger and garlic. 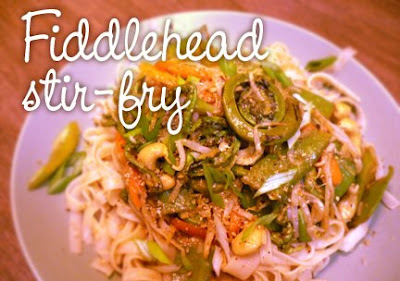 Heat oil in wok or sautee pan over medium heat and stir-fry the fiddleheads for 5 minutes, then add all remaining ingredients minus garnishes. Cook about 5-10 minutes until all veggies are cooked but still crunchy (you may want to cover with a lid). Serve with steamed rice or rice noodles (see recipe that follows), topped with green onions and sesame seeds. Serves 3. *NOTE: This recipe would be great with asparagus if you don't have fiddleheads. Chop asparagus into 2-inch lengths, discarding the hard white ends, and steam for a few minutes to soften. Then add to the stir-fry along with remaining vegetables. Add the noodles to a large pot of boiling water. Cook for 5 to 7 minutes until noodles are cooked. Drain and rinse under cold water, then add to a wok or pan with the hot oil. Saute for a few minutes with the remaining ingredients. Serve immediately. Makes enough for 3 dishes. That looks beautiful Claudia! Your fiddlehead posts have brought back fond childhood memories of picking them roadside. Thnks for sharing this vegetable made recipe. Fran, if i am trying to balance pitta and get my vata down, would i prepare food as suggested for vata types, to lower it? or if not, then how..ahh help! It's always tricky trying to balance 2 doshas at the same time! Is there one that's giving you more grief than the other? I am Pitta-Kapha (in that order) and my Ayurvedic practitioner suggested that I follow a diet that is 2/3 Pitta-pacifying, 1/3 Kapha-pacifying, and add a dash of Vata-pacifying food for balance. You could do this 2/3 - 1/3 combo with your Vata and Pitta, depending on which is more aggravated at the moment. So for this recipe, if you are trying to pacify Pitta first and Vata second, you could follow both recommendations (use sweet potato, minimize spices and sesame seeds, AND have all veggies well-cooked, but skip the chili flakes).